What corrupted beings await you inside the Corrupted Gardens Palace? With the gates closed for so long who knows what beasts await you inside? Take inspiration from our Celtic world and design what foe you think awaits heroes in the Corrupted Gardens Palace! 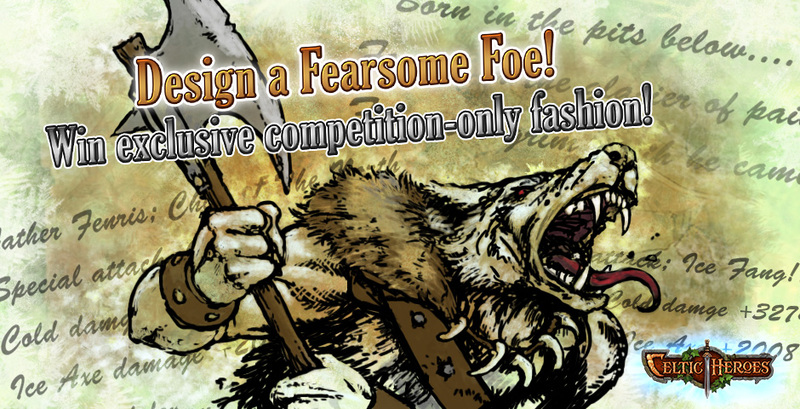 Capture the essence of a Celtic Heroes foe by drawing and/or writing up your design for a mighty enemy. Are they skeletal like the liches and reavers? Are they overgrown with corrupted plant life? Giant foes tainted by the corruption? Deadline Friday 8th of June - Winners will be announced within 2 weeks of competition end date. Maybe I’ll actuslly enter this competition. Quick question though. I’m a terrible artist, like terrible terrible, but I may have an idea for a mob design wise. Does the drawing need to be decent or could one hypothetically win off of design? Reference images can be used too! We will be judging on creativity so don't worry if your art skills are lacking! WHEN WILL THE PALACE BE RELEASED????????????? Are you looking for us to design everyday mobs ,or by "mighty foe" a boss? Is it contestant's choice? Darkwarrior534 wrote: Are you looking for us to design everyday mobs ,or by "mighty foe" a boss? Is it contestant's choice? Muldar wrote: Heroes! You've ventured into the Corrupted Gardens but this is only the start of your adventures in the realm of the gods! What is the difference between Teal and Mauve ? I guess I should put my writing cap on. Good luck to other entrants though. BrandonHeath wrote: What is the difference between Teal and Mauve ? Teal is a blue/green color and mauve is a pink/purple.